This supplement clocks in at 19 pages, 1 page front cover, 1 page editorial/ToC, 1 page SRD, leaving us with 16 pages of content, so let’s take a look! 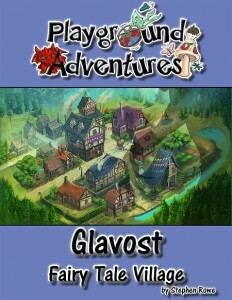 Before we do, though: Since this is Playground Adventures: This village featured first in the absolutely, I can’t emphasize this enough, STELLAR “Pixies on Parade“-module – I VERY MUCH suggest getting this module! As for age-range, I consider this appropriate for ages 4 and up if the kid in question is pretty mature; more sensitive kids can consider some components a bit more creepy, but ages 6 and up should do just fine and in fact, enjoy this – much like several of my most beloved childhood movies, there is darkness herein – it makes the fight worthwhile. And yes, much like e.g. Secrets of Nimh and similar movies, this has resonated with me as an adult as well. Editing and formatting are very good, I noticed no significant glitches. Layout adheres to Playground Adventure’s beautiful 2-column full-color standard and all new creatures herein with the exception of the Nightmare King receive gorgeous artworks in Jacob Blackmon’s style – and the mahr in particularly is rather cute in a twisted sort of way. The pdf comes fully bookmarked and the maps, though featured before, have lost nothing of their splendor. The pdf comes fully bookmarked for your convenience. Stephen Rowe’s Glavost is a great town – it’s unique, captures its theme perfectly well and sports superb artwork. However, it does not fully reach the level of detail of Raging Swan Press’ village backdrops – some more detailed information on clothing-habits, names and the like along some sample encounters would have gone a long way, particularly considering that the new gremlins herein practically beg to be asked in conjunction with Pixies on Parade. Similarly, if you expected an expansion to the concept of imagination magic, I’ll have to disappoint you. Still, as a stand-alone, this works rather well. Know how it works even better, though? If you consider this the extended cut version-expansion for Pixies on Parade. I would have loved to have this pdf when I ran the module, for the new creatures herein demand being used in the beginning of the module and the nightmare king stats can make for a cool super-boss (perhaps after a further temporary level-upgrade) or even for a sequel. I really like everything in here…but I’ve liked a lot back in Pixies on Parade. If you get this, be aware that there’s a lot of overlap between the two, though this pdf is obviously more detailed. If you don’t mind that and plan on running Pixies on Parade, then get this NOW. If you do mind, you may want to consider the decision a bit more carefully, though the price-point is low and fair as far as I’m concerned. Personally, I enjoyed the new critters herein enough and the means for expanding the narrative and to craft your own sequel for the superb module are certainly appreciated – now excuse me, I need to start writing…oh, final verdict? Hmm, that’s a tough one. As mentioned before, if overlaps between books annoy, you, detract a star…if, however, you want a fairy-tale village with gorgeous maps and some thematically-fitting critters to accompany it, or if you want to add more oomph to Pixies on Parade, then this is for you and well worth a final verdict of 5 stars. You can get this cool supplement here on OBS and here on d20pfsrd.com’s shop!